Six Weeks Left in our Spring Semester! ​Classes are still available for those who would like learn Flamenco. ​2019 Spring Semester at EmiArteFlamenco Academy. Monthly Passes and Drop In Rate are available. Emiarteflamenco Academy has won First Place for Dance Studio in the 2019 Journal North Readers' Choice! We would like to thank everyone who voted and The Journal North. We are thankful for your love and continued support of Emiarteflamenco, Emiarteflamenco Academy, Flamenco Youth de Santa Fe, and La Emi! One way the New Mexico Governor's Mansion Foundation raises funds to preserve and maintain the Mansion is to produce ornaments reflective of the rich culture of New Mexico. These ornaments are of the highest quality and are beautifully designed, so they are very collectible. All proceeds from ornament sales benefit the New Mexico Governor’s Mansion Foundation, a non-partisan, non-profit 501(c) 3 organization operated by volunteers. New Mexico has played a great role in the development of the art of flamenco in its modern form. Due to New Mexico’s own fascinating history as being a confluence of many converging—if oft-times warring cultures—the state is perfectly suited to being synonymous with flamenco. New Mexico’s famous fusion of cultures and influences has taken something that began around gypsy campfires of Europe before travelling abroad and into court performances before the royals, into something that is accessible and relatable for everyone. With its roots in many types of folk dance, flamenco is now ready to command the grand stages of the world. 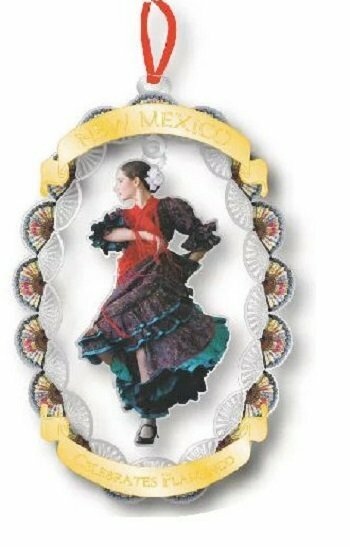 The subject of the Flamenco Dancer ornament is New Mexico native Emmy Grimm, known as “La Emi.” She was a protégé of renowned dancer María Benítez, and is now a powerhouse artiste in her own right. La Emi has danced and toured throughout the world, including training under Carmela Greco of Spain. La Emi has opened her own school, EmiArte Flamenco Academy, a professional company EmiArte Flamenco, and a youth company, Flamenco Youth de Santa Fe. The New Mexico Governor’s Mansion Foundation is proud to present this exquisite design, one that demonstrates the state’s unique connection to a proud and ancient art form. This was an incredible summer never to be forgotten. A sincere thank you to everyone who showed their love and support. Thank You New Mexico Homes for the feature article on your website! New Mexico Homes, a resource for Santa Fe, NM Real Estate, recently featured us in an article. Read it here: Learn to Dance EmiArteFlamenco Style. ​NewMexicoHome.com is an excellent resource if you are looking to buy in our beautiful hometown.